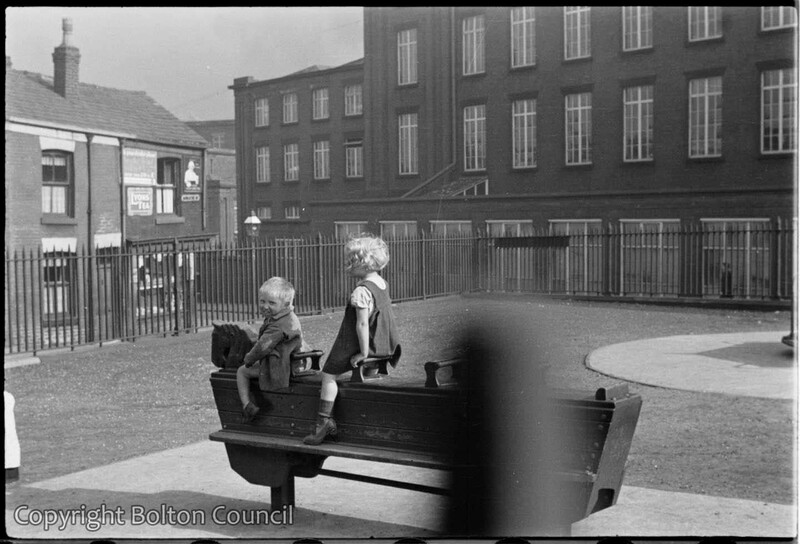 Children play at Marsh Fold Lane Playground. The area has changed a lot since the photograph was taken, and most of the terraced housing has been replaced. I remember this park, I used to live on Clarke street during the 90’s when I was a kid (it looked a lot different then as well compared to this photo). Being kids, my friends and I from the area at the time always referred to Victory Street Park (about 1 min walk away from this photos location) as ‘Top Park’, and Marsh Fold Lane Park as ‘Bottom Park’ due to Clarke street being on a gradient. It was when I was a child a nice small park, it had quite a large slide (which you had to use the remains of an old tree stump to get up the slide) monkey bars, swings, a small round about and climbing bars shaped as people in different posses. It is quite sad now when I see it, as everything has now been removed, only the rubber type floor (to stop kids hurting themselves) remains and the whole play ground is slowly beginning to be reclaimed by plants and weeds. Thanks for this photo, it’s good to see what it once looked like before even my time. It’s sad to see it now. That’s a nice recollection, thank you Nitesh.